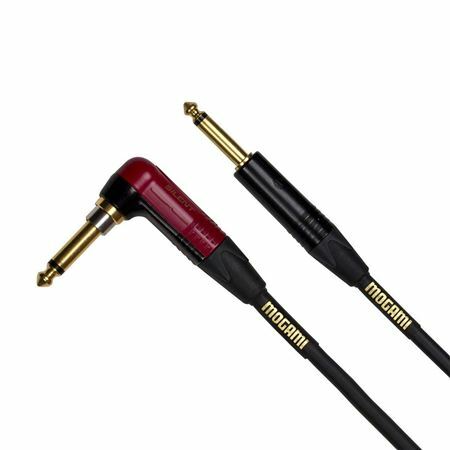 Shop Mogami Gold Instrument Silent R Cable with Angled Silent Plug from AMS with 0% Interest Payment Plans and Free Shipping. A high-definition instrument cable, Gold Instrument Silent R has an angled Silent Plug connection on one end and a straight connection on the other. Neutrik Silent Plug gives users the ability to hot-swap instruments without that earsplitting pop. This high clarity cable uses quality 1/4 inch connectors and carbon impregnated PVC to provide an additional shield layer to eliminate any handling noise. 5 Star plugs!! They are 100% silent and worth every penny!!! I need to swap basses quickly during a performance and this cable gives me the ability to do so without noise or worrying if I disabled the mute function. I love the silent plug feature. No more annoying noises when switching guitars ! This chord compared to all of the other basic chords and even Monster cables is incomparable! Will literally change your sound! Can't go wrong with Mogami! Love the silent 90°! If you switch between guitars regularly, you need this cable for the stage or even at home! I love these cables !!! We did a comparison to our old cables, and the difference was very evident. The clarity and richness the Mogami cables offer, is hands down far superior to any others we’ve tried. I will never use cheap cables again. I’ve been playing for over 40yrs and never invested in good cables, but after listening to the difference, I’m sold. I have spent more $ on cables than I’d like to admit. Mogami is WELL worth the investment. I’m not chasing the $, I’m chasing the sound. Thank you AMS, I will be getting more at a later date. The usual standard of excellence for Mogami products....with the build quality being particularly exceptional. I use Mogami cables exclusively, and appreciate both the stellar build quality as well as the exceptional sound.